""TWO"" fabulous Ardbeg whisky tumblers. Stylish High Quality Glassware - Made in Italy. Decanter: 1000ml Height: 237mm Glasses: 300ml Height: 83mm. Part of the Stunning Bormioli Rocco Range - Italian Design. Dishwasher safe. Serving dinner guests your best port or whisky from the bottle is not always the best way of going about things. A very handsome rounded Baileys 25cl balloon glasses,a great gift for the style- conscious Baileys lover. The glass feels amazing in hand - Standing 11cm tall with a 8cm diameter and weighing 270g feeling solid. Very well designed for swirling your Baileys around! This is the classic glass used for serving Baileys all over the world. This stunning glass would enhance any bar, collection or make a super gift. Whisky / Mixer Glass. Glass Tankards. Pint Glass. High Ball Glass. Wine Glass. Glass Awards. The contract between us shall be governed by the Laws of the United Kingdom and any dispute between us will be resolved exclusively in the courts of United Kingdom. The Sailor Jerry glass with tattoo mortif. A rather voluptuous tall glass for the purpose of imbibing one of the world's greatest rums, Sailor Jerry. The only glass for your Sailor Jerry. Text colour no colour just engraved into glass. (can be used for any shorts)F ree Gift box. This lovely stern whisky glass makes a perfect gift for any whisky drinker. At GiftCookie we specialise in providing quality personalised gifts at affordable prices for a variety of special occasions. 50 Pounds Gin Copa Glass. Condition is Used. Some slight scratches on the glass from general use. Dispatched with Royal Mail 2nd Class. 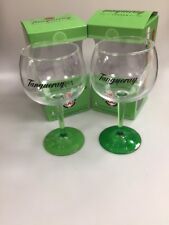 2 X Stunning Brand New Silent Pool Gin Glass Glasses. Condition is New. Dispatched with Royal Mail 2nd Class. For sale Glenfiddich 12 Year Old whisky triangle heavy base glass tumblers. Over 9.5cm tall and about 8cm across the top. nd Class to 1. GLENFIDDICH WHISKEY POURER. . Condition is Used. Dispatched with Royal Mail 2nd Class. Beautiful old whiskey pourer in working order stands about six inches high and weighs 240g much more impressive than some newer version's i have seen recently. Item will be dispatched within 12 hours of payment. A beautiful brand new Fever-Tree Crystal glass. Made by Dartington, Standing 12cm with a 8cm diameter The ultimate mixer glass. This stunning glass would enhance any home,bar,collection or make a super gift. Sorry bottle not included. 645ml capacity. GIN & TONIC. Product details. Perfect for special occasions. 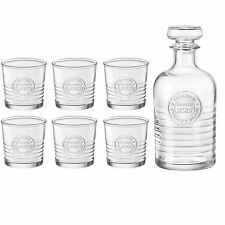 ELEGANT WHISKEY GLASSES : bold, original and exquisite shape with a heavy base and fine look; the shape of the Whisky glasses improves the tasting experience of the Whiskey / Bourbon / Scotch. THE RIGHT GLASSES : each glass is crafted with a wide opening allowing the best angle for the nose to capture the subtle flavors and aroma of bourbon while the squared corners lend an easy sip. Bargain Buy 2 x New Beefeater Pink Gin Glass. 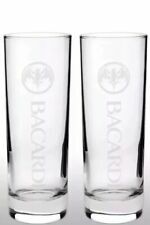 2 x Havana Club tall slim glasses with logo. The tall Havana Club Glass is the perfect size for serving up a classic cocktail, such as a Mojito or Cuba Libre with the popular Cuban rum. These stunning glasses would enhance any bar, collection or make a super gift. Will dispatch immediately and contents will be secured safely. A brand new Smirnoff vodka tall glass. The Smirnoff glass with etched logo. Standing a impressive 16.5cm with a 6cm diameter Simply beautiful. This stunning glass would enhance any bar, collection or make a super gift. Will dispatch immediately and contents will be secured safely. 300ml Bombay Sapphire Hi-Ball Glass . Perfect for the ultimate G&T with a stunning blue glass base and the iconic 'Bombay Sapphire' engraved on the glass and not cheap screen printing so it won't wash off like cheaper versions. Browse All. Supplied with Tea Light. Silver Finish. Why Choose Us! We Accept Only. Chef Clothing. New Arrivals. Catering Utensils. Beautifully boxed Gin Goblet. ideal gift. Box contains a recipe for the perfect drink. Could be used as pencil tins or other uses if you didn't want to use them as cocktail cans. Glenfiddich x 6 Whisky Glasses Boxed . Condition is Used. Collection in person only. The whisky glass is made to high specification (being 300 grams in weight!). and is the regular tumbler size, being. "Best Man" Whisky Glass. AND Coaster Gift Set in a QUALITY INSCRIBED LIDDED GIFT PRESENTATION BOX. Two Stunning Grey Goose Stemmed Vodka Glasses Brand New (fast Delivery). Condition is New. Dispatched with Royal Mail 1st Class.